Eggs are such an easy way to provide protein and nutrition into your meals. Who says eggs are just for breakfast either? 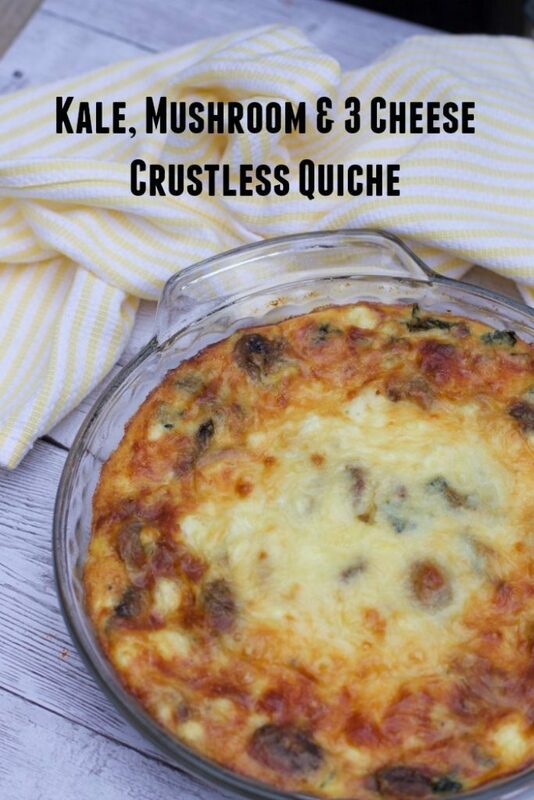 I love a good quiche recipe, but when you are trying to cut calories, creating a crustless quiche is one great option. Not to mention you can add more cheese to make up for the crust!! I will take cheese over crust anytime. Whenever I can combine some yummy fresh ingredients with some cheese the kids really never know that I am trying to trick them into eating more veggies. 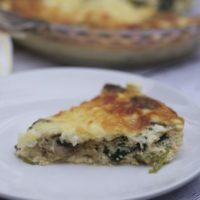 You will adore this Mushroom, 3 cheese and Kale Quiche recipe that comes together in only minutes for a great weeknight meal and has no crust. Here are 23 all science-backed health benefits of kale. The recipe includes only a few fresh ingredients that you need to cook prior to adding them to your quiche, otherwise it is a dump it in recipe. 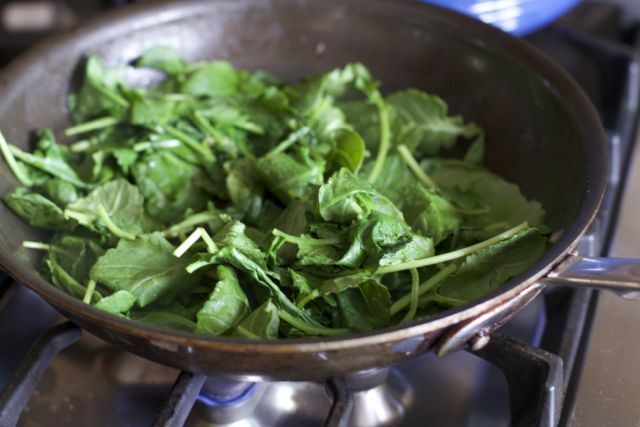 If you prefer to use frozen spinach, you cut one cooking step. 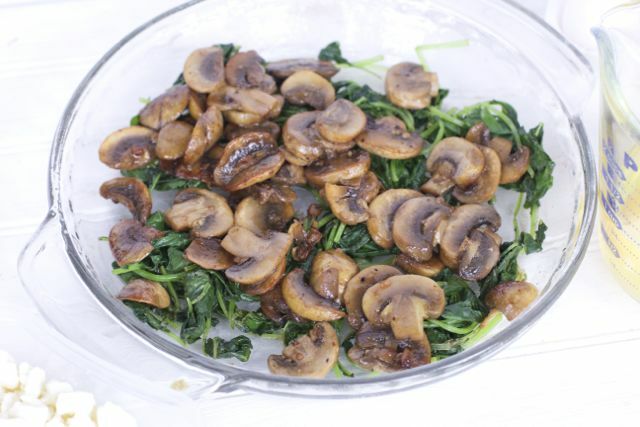 Saute’ your mushrooms in a little olive oil until all the water is gone. Set aside leaving any oil/juices in the pan. Add the Kale and steam/cook until completely wilted. You will still need to squeeze out any liquid once it is cooked. Layer your kale and mushrooms in a greased pie dish. 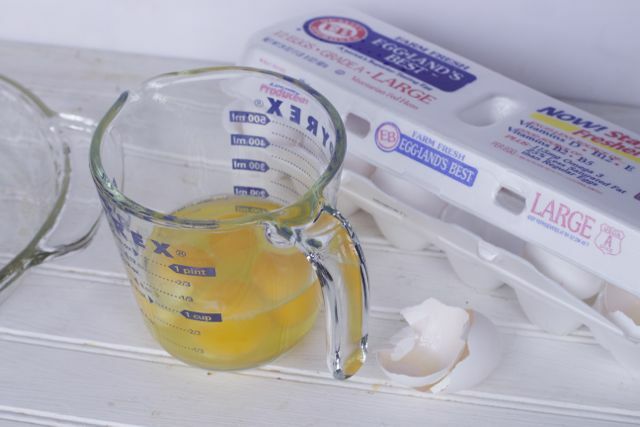 Now for the egg mixture, we use Eggland’s Best eggs over ordinary store brand eggs for recipes like this. The eggs are fresher and contains more vitamins and nutrients. Did you know that compared to ordinary eggs, each Eggland’s Best egg offers four times more Vitamin D, more than double the omega-3s and contains 25% less saturated fat. Read more about Eggland’s Best egg nutrition. 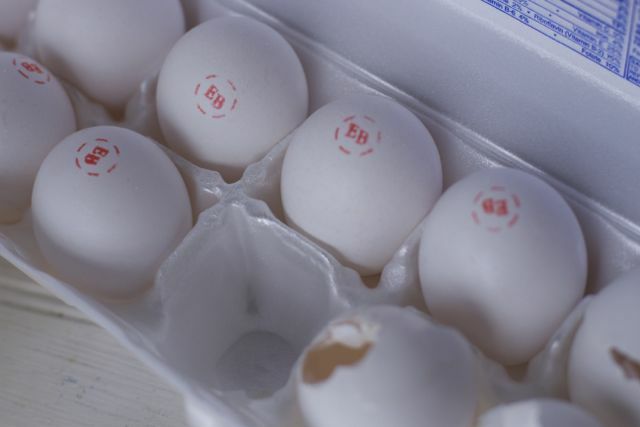 You always know its a Eggland’s Best egg by the stamp on the eggs. 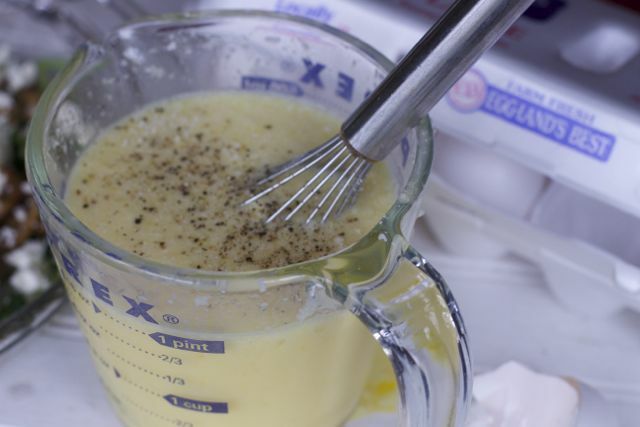 Whisk the eggs, milk, parmesan cheese and seasonings together. 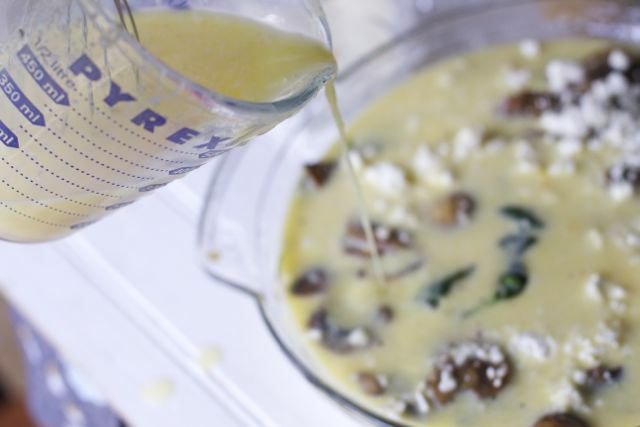 Pour the egg mixture over your cooked veggies and feta cheese. 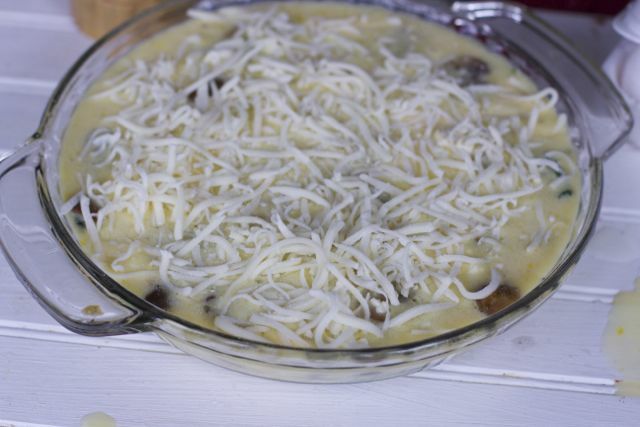 Top with the third cheese, shredded mozzarella cheese. This actually creates a yummy and almost crispy top. Bake until you put a knife in the middle and it comes out clean. This kale quiche recipe is such a simple but wonderful meatless dinner option. 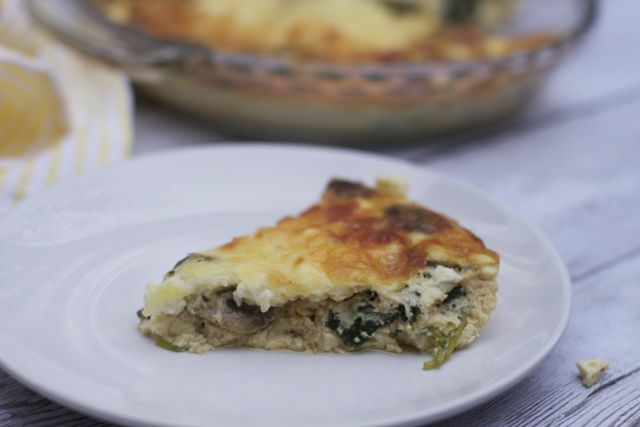 You can see the amazing flavors in each slice of this 3 cheese, mushroom and kale quiche. 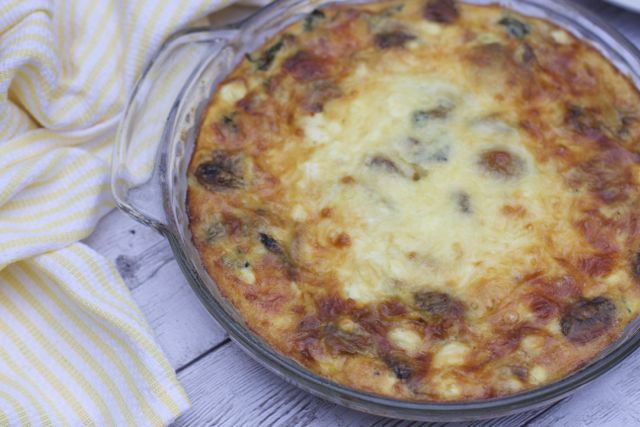 A wonderful combination of cheeses and veggies in this healthy crustless kale quiche recipe. Preheat your oven to 350 degrees. Saute the sliced mushrooms in a skillet with olive oil. add the minced garlic, and sprinkle a little salt and pepper. Turn the heat on to medium-high and sauté the mushrooms until they release all of their moisture and no more water remains on the bottom of the skillet This is a very important step. 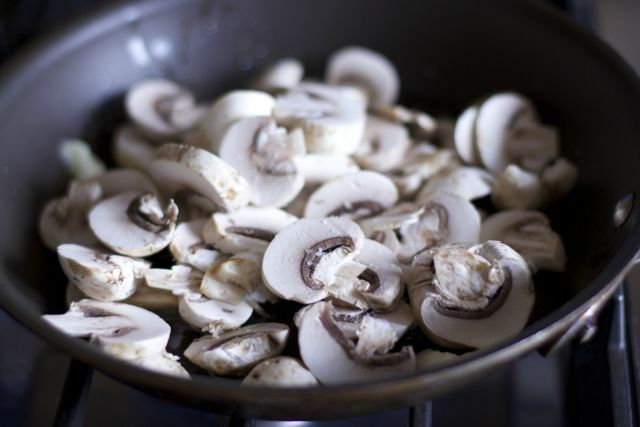 Place the mushrooms in a bowl, and leave any juices in the pan. Add the baby kale. Cook until completely wilted. I like to cover the pan for a quick wilting process. Spray a pie dish with non-stick spray. 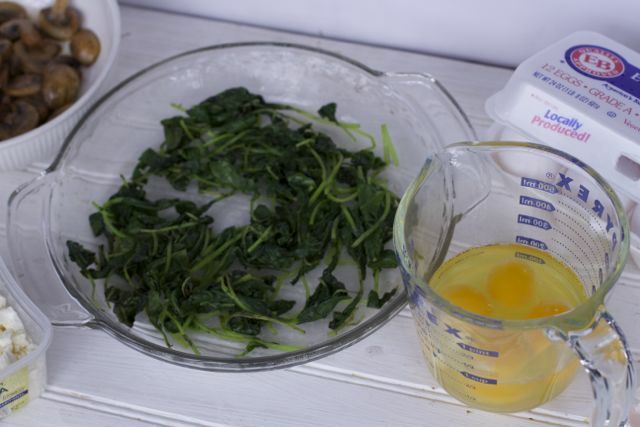 Squeeze the rest of the water out of the kale spread it out on the bottom of the pie dish. Add the cooked mushrooms and crumbled feta. In a medium bowl whisk together the eggs, Add the milk, parmesan, and another small sprinkle of pepper. Whisk to combine. Pour the egg mixture into the pie dish covering all the veggies and feta. yummy! I have to try this recipe for sure. The quiche looks great! The recipe sounds simple and I’ll have to try it. Quiche is one of my favorite brunch menus! I love that this is crustless and it’s a great way to add some kale into my diet. Plus, mushrooms are to-die-for! I love a lovely, fluffy egg dish anytime. Surprisingly I have never made a quiche but I am actually going to make this right now for a late brunch. I think my kids would love it and I have all these ingredients on hand. That sounds really good-I have some baby kale in my garden that would be perfect for this! This looks so good! 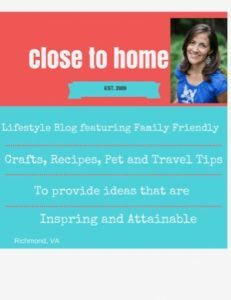 I’ve never thought of adding kale to a quiche, but it sounds yummy! I recently stopped using a crust when I make quiches and my family doesn’t even notice, LOL! Looks like a yummy and healthy recipe. Something I’ve always wanted to try! what a great recipe to make and have on the weekend with family. Looks so good. Quiche is my favorite. This looks like a great recipe and super easy to make. Great for Easter morning. I love quiche! I am going to try this recipe out for sure.